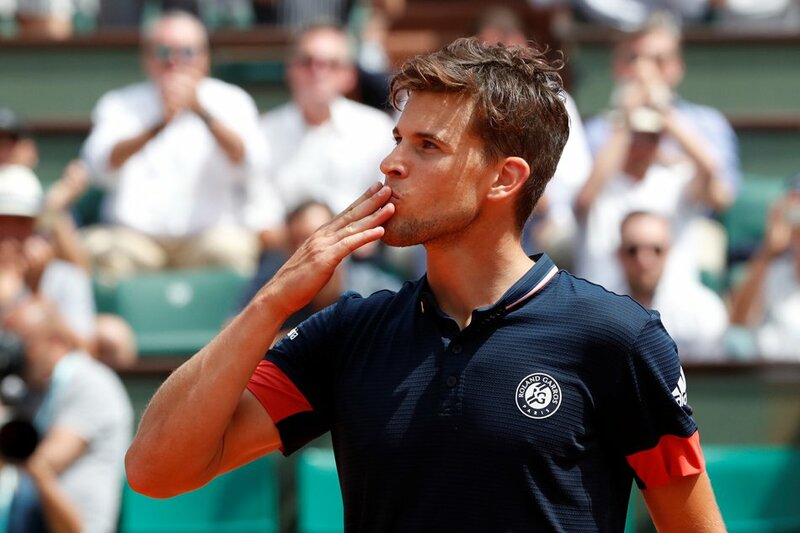 Austrian Dominic Thiem’s rise to the top continued when he ended unheralded Italian Marco Cecchinato’s run to reach the French Open final with a 7-5 7-6(10) 6-1 win on Friday. The seventh seed is the first Austrian man to reach a Grand Slam final since Thomas Muster triumphed at Roland Garros in 1995. He will take on either Argentine fifth seed Juan Martin del Potro or 10-times champion Rafael Nadal. Cecchinato, the world number 72, played fearlessly and used his whole arsenal of claycourt weapons. But he came up short against the only player to beat Nadal on his favourite surface this season. The 24-year-old Thiem, the youngest man since Nadal to reach the final in Paris, ended the contest on his first match point with a forehand winner. “Maybe the experience helped a little bit. But the big key was the second set tiebreak, because it was very close and I saved I think three set points,” said Thiem. “If I lost that tiebreak, it would have been a very close match I think, and I didn’t want that. Cecchinato proved to be no pushover even though he had never won a match at a major before this year’s French Open. Thiem was the aggressor early on and he broke in the first game before holding to love for a 2-0 lead. Cecchinato’s nerves settled and the Sicilian who was suspended for match-fixing in 2016 before being cleared on a technicality, unleashed some trademark backhand winners. But Thiem had too much pace and power. Cecchinato mixed it up with drop shots and gradually found his range to set up three break points at 4-3, which Thiem saved thanks to his strong first serve. The Austrian netted an easy volley to give another opportunity to Cecchinato, which he seized, forcing his opponent to a backhand error. Thiem sent Cecchinato scurrying around the court before breaking decisively for a 6-5 lead with a lovely forehand winner. He then held serve to bag the first set. The second set turned into a tight tactical battle with neither able to break serve. Thiem’s massive forehand allowed him to race into a 5-2 lead in the tiebreak. But the Austrian got nervous and wasted several set points, one of them when he shanked a routine volley at 6-4. “When I missed that volley it wasn’t a very nice feeling. It was destructive a little bit,” Thiem, who won two claycourt tournaments this season, said. His huge serve helped him to save set points too and he finally gained the upper hand to take a two-set lead.